Tom Slinger singing about a melancholy man. The perfect song for a rainy day. Now I want a leopard. Not the last time I’ll live at number 10, originally uploaded by benaston. The time of living at 10 Ericcson Close is sadly at an end. For those of you that I forgot to tell, today I’m off to Vancouver, (via India, HK and Australia) to begin a new life as a bear hunter. 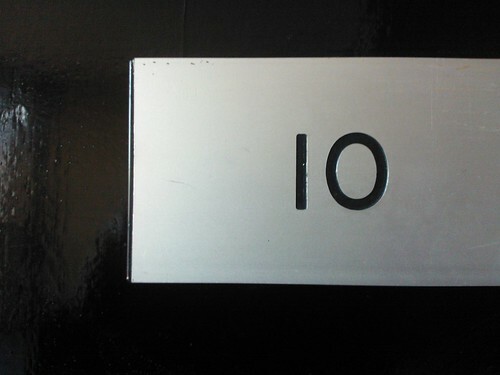 I rather suspect next time I’ll be living at number 10, it’ll be when I’m Prime Minister. It’s always nice to showcase a bit of local Wandle Creek talent. Tom Jenkins from The Theory, based down the road in Wandsworth, has come up trumps with his latest stop motion animation film. Featuring music by the excellent Cinematic Orchestra, the film is about a lonely desk toy who longs for escape from the dark confines of the office so takes a cross country road trip to the Pacific Coast in the only way he can – using a toy car and Google Maps Street View. This starts off a bit weird, grows on you, and then becomes totally amazing. If I did all the things I thought I thought I was capable of doing, then this would probably be the result. And I’d probably be dead too. Chuck Norris would be so proud.